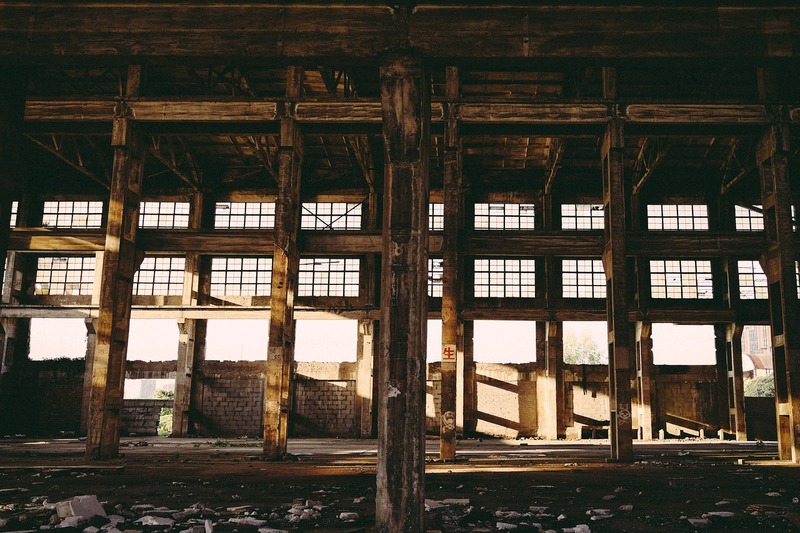 Structural steel has been widely used in construction for commercial buildings since the first steel framed building, Rand McNally Building erected in 1890. Since then steel has been used for major construction projects. The availability of steel makes it much easier to use. First, it binds well to concrete and it has many characteristics that make it even better than concrete, when it comes to building projects. Steel is still one of the most preferred choices of material in construction because it takes less time to erect plus it makes for a perfect combination of light weight, high strength, and ease of fabrication. It has been a major component in commercial building projects. Talking about steel, H-Beams and I-Beams are two of the most common structural members used in construction to provide support for building and walls. Let’s take a look at these two structural members. H-Beam, as the name suggests, is rolled steel joist (RSJ) with the cross section in the form of the capital letter H. It is the one of the most common and widely used structural steel member used in both residential and commercial building projects. Because of its superior mechanical properties and better strength to weight ratio, they make for the preferred choice of material for mezzanines, bridges, and platforms. Plus they have wide flanges which are commonly used in residential building projects. I-Beam, as the name suggests, is an I-shaped structural member with the cross section in the form of the capital letter ‘I’. Unlike H-beams, they have slender flanges which are typically narrower with tapered ends for increased strength. This makes them good at bearing load under direct pressure. Because of their high tensile strength, they are used in steel framed buildings and bridges and other civil projects. H-beam, as the name suggests, is an H-shaped structural member made of rolled steel and is known as a wide flange beam. It is one of the most commonly used structural members used in the United States. It looks like an ‘H’ over its cross section and is incredibly strong and has a greater surface area on the cross section of the beam. I-beam, on the other hand, is also known as H-beam but looks like an ‘I’ from its cross section. It is basically a rolled steel girder or a joist with a cross section in the form of the capital letter I. In terms of design, H-beams have longer, wider, and heavier flanges than I-beams but both the terms H-beam and I-beam can be used interchangeably most of the times and commonly referred to as rolled steel joists (RSJ). The horizontal element at the top and bottom of a beam is called a flange, which is typically narrower in I-beams but are almost equally wide as such. The height of a beam is the web, which is thicker in H-beams which makes them relatively stronger than I-beams. I-beams, on the other hand, have slender webs and tapered flanges. H-beams are economical section steel with more optimized cross-sectional area of distribution and a reasonable strength to weight ratio meaning it can provide more strength per unit of weight. This makes welding of H-beams relatively simpler than that of I-beams. And because of its greater surface area on the cross section, it is considered to have a high strength ratio. However, I-shaped beams are typically deeper than they’re wide, which makes them quite good at bearing load under local buckling. Plus, I-beams are lighter than H-beams which mean they will not be able to take as much force as H-beams. Because H-beams have thicker walls and flanges, they are ideal for mezzanines, platforms, bridges, and other common building constructions both residential and commercial. Wide flanges are commonly used in residential projects. The inside dimensions of H-beams are made constant so as to make them a preferred choice of material in trailer and truck bed framing. 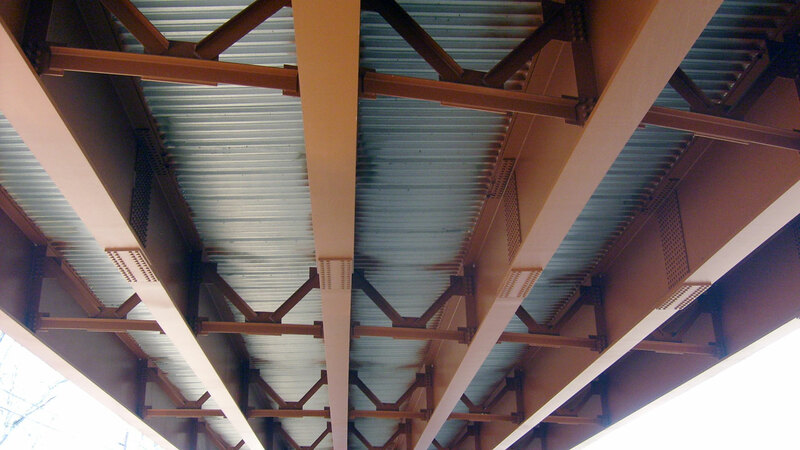 I-beams, with their increased strength of the flanges, are the preferred choice of shape for structural steel buildings, bridges, and other civil projects. Apart from commercial and residential building projects, they are also used to make support frames and columns for trolley ways, elevators, trailer and truck beds, hoists and lifts. 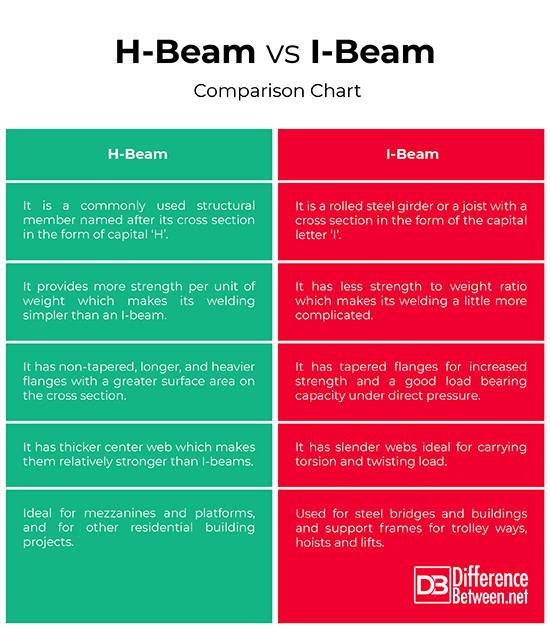 While both the terms H-beam and I-beam are often used interchangeably in the construction industry, saying one is better than the other is quite subjective. Both are the two most common structural steel beams used in various structural steel works such as support beams for both commercial and residential building construction. Both look almost same from the outside, except they differ in geometry. They are the two versions of the structural steel beams used in a wide range of applications. H-beam has an H-shaped cross section, while I-beam has a cross section in the form of the capital letter ‘I’. Technically, an I-beam can be referred to as an H-beam with slightly different mechanical properties such as strength to weight ratio, load-bearing capacity, tensile strength, and so on. Sagar Khillar. "Difference between H-Beam and I-Beam." DifferenceBetween.net. October 4, 2018 < http://www.differencebetween.net/object/difference-between-h-beam-and-i-beam/ >.